Ghana players Asamoah Gyan and Baffour Gyan threatened to walk out on the Black Stars in the wake of their unconvincing 1-0 win over Namibia. BBC Sport has learnt the brothers had packed their bags and were ready to leave the team hotel on Saturday but were persuaded to stay by team-mates.Asamoah, 22, was booed during Thursday's match after missing several scoring chances for the host nation. Some local radio stations in Accra strongly criticised him on Saturday.After hearing the sports discussion programmes, Asamoah decided to leave, and older brother Baffour joined him in solidarity.Asamoah plays for Udinese in Italy's Serie A. Some radio stations had been going on all morning with personal attacks on Asamoah and in fact we are all sick of thisUnnamed Ghana playerGhana FA spokesman Randy Abbey denied any knowledge of the issue, but two players in the Black Stars camp have confirmed the incident to BBC Sport.A player who spoke to the BBC on condition of anonymity said: "We were shocked when we saw Asamoah and Baffour dressed up to leave the national team hotel. "Some radio stations had been going on all morning with personal attacks on Asamoah and in fact we are all sick of this. "Players and coaches came in and we ensured that they stayed with the team. 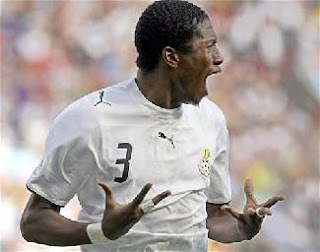 "The threat from the Gyan brothers came just a day after Asamoah made an emotional appeal to fans of the Black Stars over Thursday's taunts.Asamoah said: "I'm very sad because Ghanaians know what I can do on the field. The downfall of a man is not the end of his life. "I have played 22 games for my country and scored 15 goals at my age. "So if things are not going well, I expect encouragement from the fans, not criticism. "I am working on my play and I will find my rhythm. If things go well it will be better for the team and Ghanaians as well. "The Black Stars have been unimpressive despite winning their opening two games in Group A of the tournament.